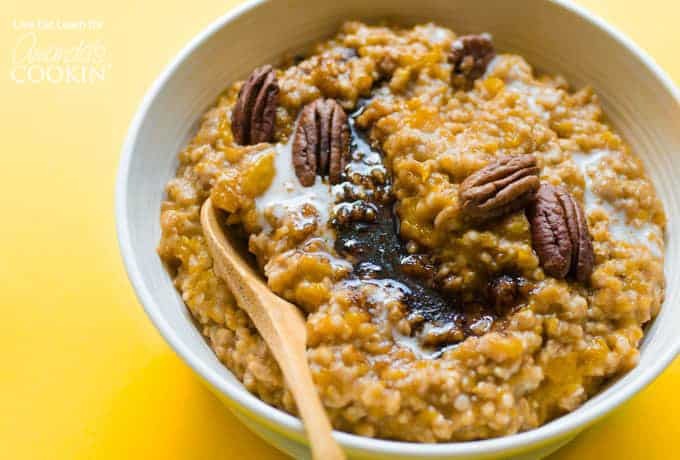 Crockpot Butternut Squash Oatmeal: a delicious fall breakfast! 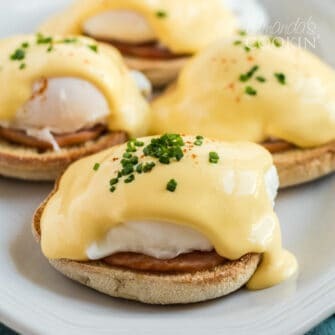 Looking for a bone-warming fall breakfast recipe that’s as easy as it is tasty? This crockpot butternut squash oatmeal is your answer, filling your house with the delicious aroma of autumn and cooking into creamy perfection while you sleep! My slow cooker is a stable appliance this time of year. Something about the cold weather combined with an increasingly long to-do list has me relying on my crockpot to cook for me. 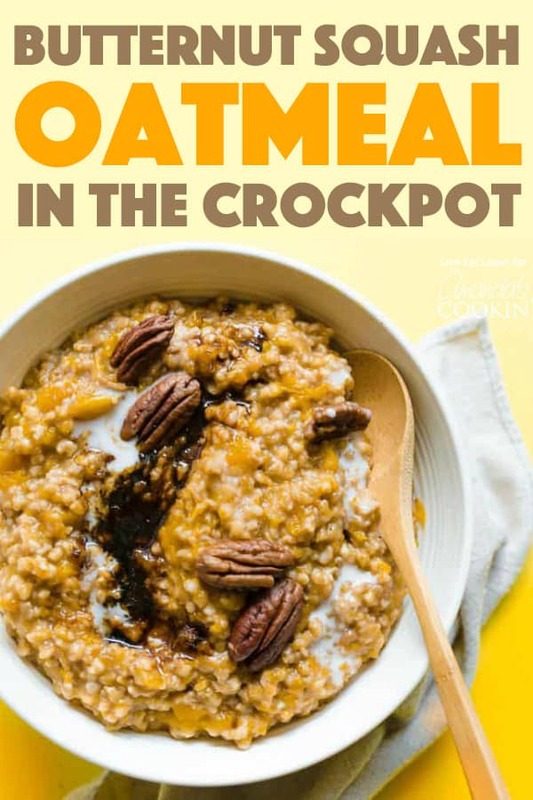 Usually, the meal of choice for cooking in the crockpot is dinner, but I recently started using it to cook my oatmeal overnight and have fallen in love with the result. I wake up to a house filled with the cozy aroma of grains and spices, and of course, a warm meal ready to go when I roll out of bed! With it being prime pumpkin and squash season, today we’re doing a deliciously healthy take on my favorite overnight oats, throwing in some cubed butternut! 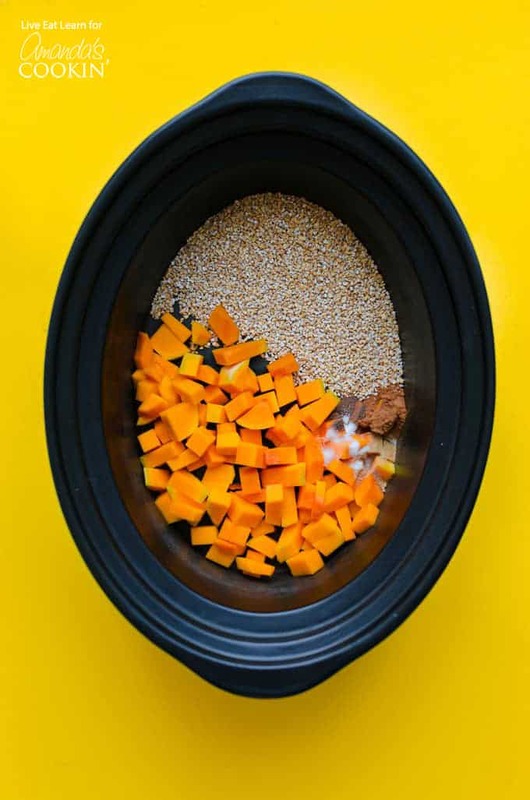 Making this crockpot butternut squash oatmeal couldn’t be easier. You’ll just chop up your butternut squash and throw it in the slow cooker along with the rest of the ingredients. Give it a good stir and cook on low for 6 to 8 hours, or until the oats or cooked and butternut is soft. Roughly mash butternut to incorporate it into the oats, and serve! 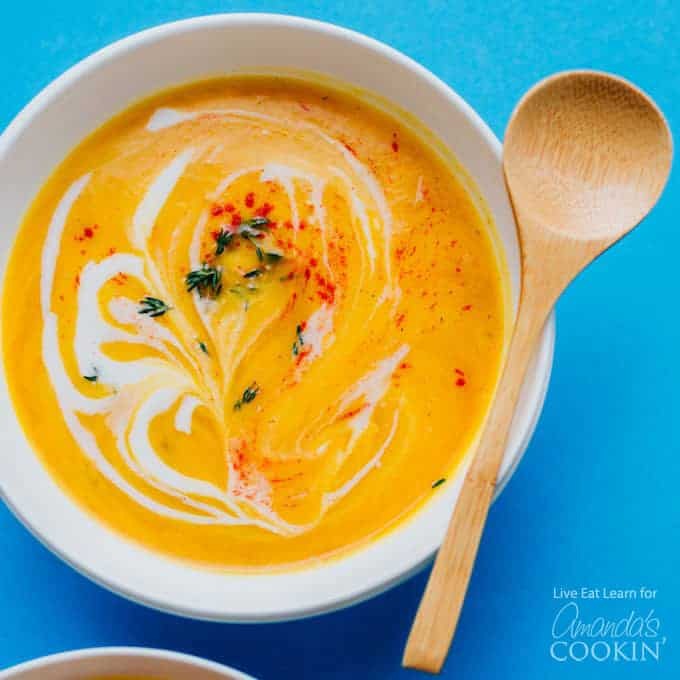 Don’t forget about our butternut squash soup, another easy crockpot recipe using butternut squash! Love crockpot recipes? Check out some more of our favorites below! Crockpot Caramel Apple Cider– hands down our favorite fall drink, and it calls for super easy prep! Crockpot Chicken and Dumplings– a comfort food classic right here. Creamy Crockpot Macaroni– this homemade macaroni is always a hit with people of all ages. Crockpot Apple Cobbler– can you say easy? This apple cobbler in the crockpot is SO good and SO easy! Looking for a bone-warming fall breakfast recipes that's as easy as it is tasty? 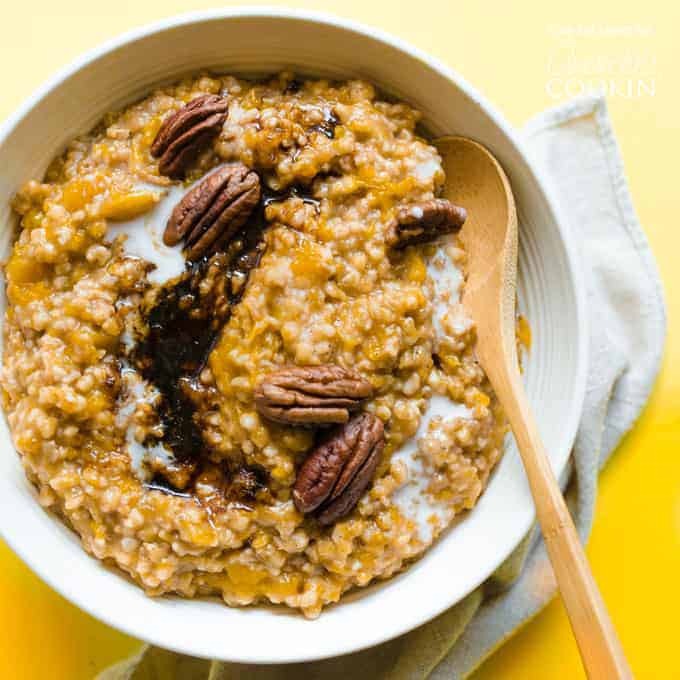 This Crockpot Butternut Squash Oatmeal is your answer, filling your house with the delicious aroma of autumn and cooking into creamy perfection while you sleep! Peel, deseed, and roughly chop butternut. Add butternut and all other ingredients to a slow cooker and stir. 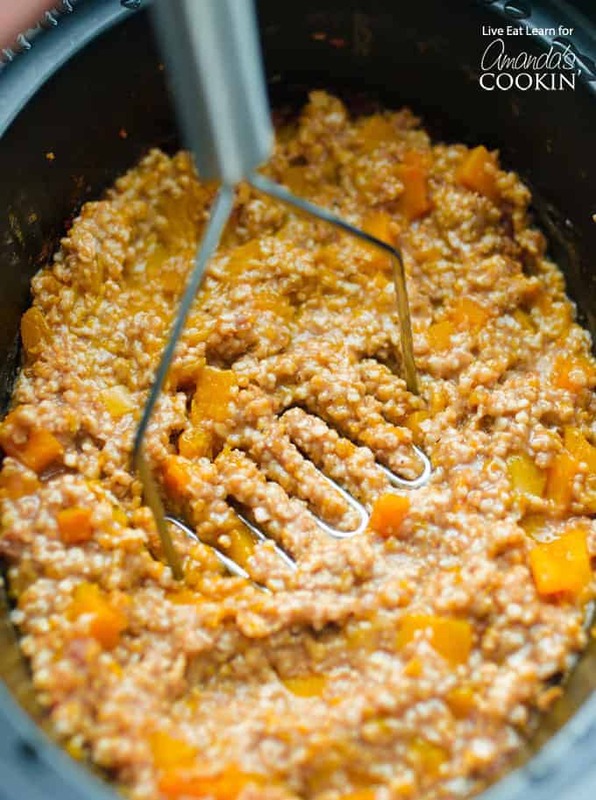 Cook on low for 6 to 8 hours (high for 5 to 7 hours), or until oats and soft and butternut is fork-tender. Use a potato masher or large spatula to roughly mash butternut. Stir to evenly incorporate. Serve warm, optionally topped with pecans, brown sugar, and milk.